Things I've Found In Pockets: "A Man's Got To Believe In Something. I Believe I'll Go Fishing." "A Man's Got To Believe In Something. I Believe I'll Go Fishing." Fishing is serious business, and it takes hours and hours. Fishermen don't mind, they will stand or sit and gaze at the water in a meditative trance, thinking about stuff. If they are all grown up, they will drink beer because, as the saying goes, "Give a man a fish and you will feed him for a day. Teach him to fish and he will sit in a boat and drink beer for the rest of his life." 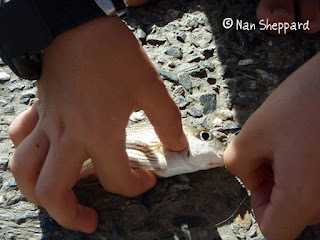 1) It is easier for small fingers to remove unbarbed hooks from the fishes mouths. Fish have spines and slime and teeth already! Learning to hold a spiny fish is a challenge. 2) It is less destructive and tearing to the poor fish when there are no barbs on the hook. With very small kids or those without casting experience, don't use a hook at all. Attach a swivel above the sinker, and press bread into the swivel. They will have the fun of feeling little fish biting their line, but will never catch anything. Little ones don't mind this too much and by the time they want a real hook, they are pros at casting where they mean to, and not into the person behind them. This is a small plastic aquarium with a lid and handle. They are available at aquarium supply shops, and often come with dividers for breeding fighter fish. 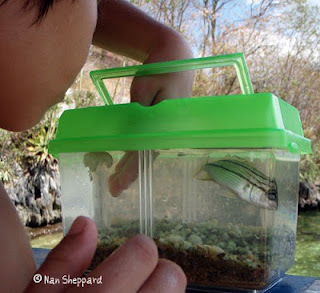 We take our aquarium everywhere, and use it for holding larger bugs, small snakes, tadpoles, and pond slime. 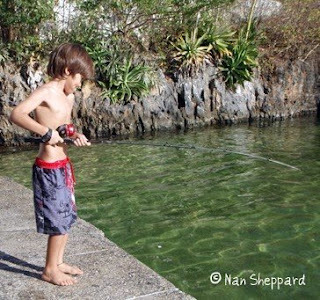 It's fun for the kids to look at their catches for a little while, but don't keep fish for longer than a few minutes or they will run out of oxygen. If necessary, change the water. When you're a big, experienced fisherman like Max, you can go out banking with Daddy and catch REAL BIG FISH! This is doubly awesome when your terribly superior big brothers didn't catch anything! I love the pictures. It makes me want to go back. Especially since the weather up here has been so wonky this year. It's the coolest and wettest Spring we've had in a long time. I like it better when it's hot. And here we are PRAYING for rain! Even old peoples is lurnin by reading you. The boys must be in homeschool heaven. I am so envious!! Looks like the picture of my childhood in Trinidad and I wish my boys could experience it. Instead we are learning about ice skating and hockey - all good things but somewhat lacking in the exploration department! Mr. T and I went fishing last weekend--it is the best fun, isn't it? We sang that goin' fishin' song by that blues singer the whole time. BTW, I tagged you for a mommy meme. Great catch Max! What a fun summer! Fishing is all about the beer. Seriously. Wow. That brings back memories for me! When I was growing up there were many, many trips fishing and hunting, with my dad and/or cousins. I wish I was in a position to go fishing right now!